What I want to achieve is connecting to a WiFi ~100M away (WPA2 Enterprise) and with that connection creating a local WiFi with a different SSID in order to connect multiple devices. First of all - are there actually any differences network-wise for these two options? I have tried both - however, I am unable to get internet connectivity on my end-devices. Let's take (1) bridging mode as example. By assigning a fixed IP on my local devies (192.168.0.10), I was able to connect to the CPE210 via LAN (192.168.0.254) and login to the GUI. I did the Quick-Setup for the Bridging mode, was able to detect the desired network and have also been able to give all authentication details. Also, I set up the AP how I would do normally. Following the instructions from the manual, I should then disconnect the LAN, change settings to get automatic IPv4 address on my Windows machine and then connect to the new AP wirelessly. When doing that, I can connect to the AP, but have 'limited connectivity'. Also I cannot access the GUI via 192.168.0.254 anymore (the IP was set as static in the settings). However, when I change my IPv4 settings of the wireless adapter to a fixed 192.168.0.10, I can access the GUI again, but still with no internet connectivity. If I read the 'Status' panel of the GUI correctly, I believe that it is correctly connecting as a client (Shows RX and TX rates), and I can also detect my laptop as end-device being connected. Any ideas what I can do to achieve internet connectivity? See attached picture for what I see under 'Status'. Currently trying a setup with 'Client mode' only, and trying to get the internet connectivity through my laptop via LAN, but also no success here. If I use a USB Wifi dongle on my Laptop, I am able to connect to the WiFi with internet connectivity. 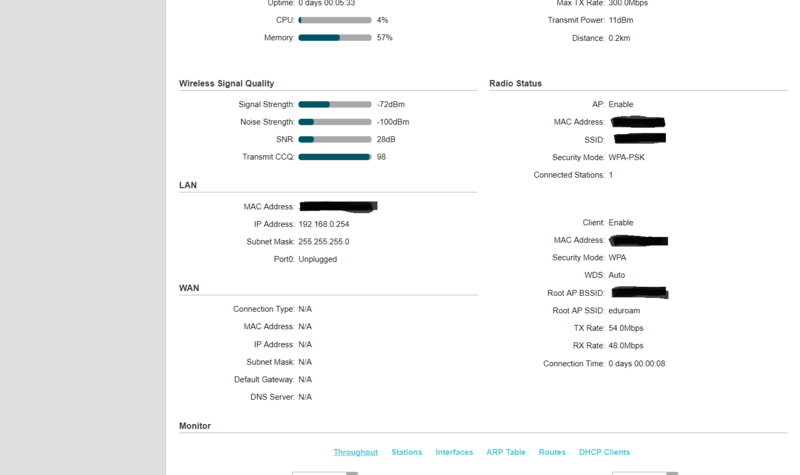 Client mode connects the CPE210 as a client to an existing AP. This means you can access the AP's network only through the LAN port of the remote CPE. No wireless connection is possible to the CPE in client mode (other than the link to the main AP). Bridge mode connects the CPE210 to the AP also as a client, but it creates another AP on the remote CPE, too. However, the WiFi coverage is only inside a 65º angle in the direction the CPE is pointing to. This might explain the »limited connectivity« depending on your position of the client device connecting to the CPE's AP. An ideal setup is discussed in the thread below (see »CPE210 - will it do what I need or do I need something else.«). 100m is almost no big distance for two CPEs, but if you connect only one CPE to another device (especially a device with omnidirectional antennas), this device might not be able to create a good signal back to the CPE over 100m. I would use two CPE510 (5 GHz band) for the direct link between any two locations and an omnidirectional AP (indoor or outdoor depending on your use case) connected to the CPE in client mode at the remote site. As for testing the connectivity: Always test IP connectivity from your laptop over a wire to the remote CPE first, then to the main AP, then to the router, then to a system on the Internet. Use the ping command and IP addresses for this test. Only if this test succeeds, you should test access to websites. There are too many settings which could be wrong to just test Internet (Web) access on a newly deployed link. I did try to use Client Mode and connect my laptop directly via LAN to the (remote) CPE. After setting up the CPE, I switched back the laptop's IPv4 settings to getting the IP address automatically - but as soon as that happens, I am not getting an IP (169.254...), and also cannot ping the CPE. This does not happen when the CPE is connected to a network other than the eduroam. I tried to change the settings for the network a bit. First I tried the standard setup (static IP for CPE with 192.168.0.254, netmask 255.255.255.0, all other empty, as seen in screenshot of orginal post), which didn't work - then I tried to assign the entries that I got when I connected my laptop directly to eduroam to find out gateway IP, primary DNS and so forth. I set the CPE to a static IP within the range of the eduroam network, changed netmask to the same and had as Default gateway and Primary DNS the same ones as the eduroam - still no luck. Any ideas what I might do to fix that? Ah, you are using EDUROAM. That's an important information, didn't see it in the your post at first read, sorry. To connect to EDUROAM you have to set up a second (local) network. EDUROAM often is configured to only hand out one IP for the client connecting to their networks. So, just set up the client CPE logging into EDUROAM in AP Client Router mode, which connects to EDUROAM as a client (as in Bridge or Repeater modes), creates an additional AP (much like in Repeater mode) and - most important - switches on routing (unlike in Bridge or Repeater modes). Then configure your very own network by setting the CPE's IP, its Gateway and DNS. Finally enable the DHCP server of the CPE and you're set. Remember to define the CPE's IP as the gateway to be announced by DHCP to your clients.